Look up, as H2O falls down, down, down in the national park. As the things warm up, water falls down in Yosemite Valley. Swing by the national park during the springtime to see this thunderously stunning show. CREATING AN IMPROMPTU WATERFALL... at home? You could fashion a super-miniature one, in the sink, for a moment, with a spoon or another kitchen implement. But the water that falls from the utensil will be weensy driplets, at best, and not the roaring, powerful, almost indescribably vast scene found at an actual waterfall on the side of an actual cliff. Encountering such a stunning sight is something many people long to do, at least once during their mortal journey, but there are some devoted waterfallians who need to commune with their favorite natural wonder at least once a year. And the best time of year to do so, at least around Yosemite Valley, which is pretty much the ultimate HQ o' waterfalls? SPRINGTIME, and specifically May, when all of that bountiful snow at the higher reaches of the Sierra begins feeling the impact of the sun's warmth and blooming season. Of course, several falls around the Big Y keep going for months, and famous Horsetail Fall finds its fandom in late February, thanks to its evening "fire"-fun light show. But if you want to see a wet stuff tumble earthwards in its full boom-boom, droplets-a-flyin' splendor, May is going to be your best bet. For that's the month when a number of quintessential valley-based cliff-spillers, including Sentinal Falls, Bridalveil Fall, and Wapama Falls, really go to town (er, um, or ground, rather). Some of the waterfalls achieve peak waterfall greatness later in May, keep in mind, so check the National Park Service's "best time" designations for each before heading for the park. MAKING YOUR OWN MINI WATERFALL... in the bathtub or pool? It's possible, even with the palm of your hand, to create an on-the-fly fall. 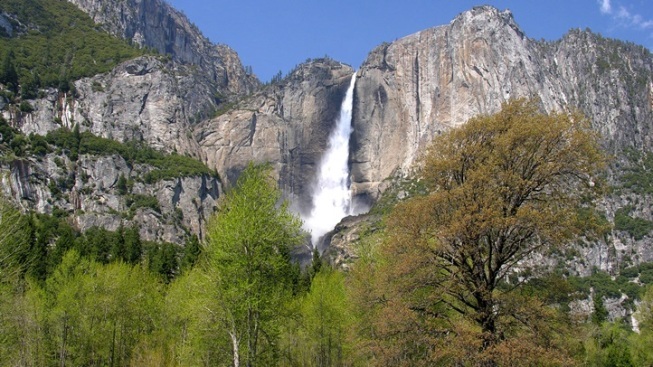 But to see some of the grandest examples of H2O meeting gravity, you'll want to make for Yosemite Valley, in the merry and very waterfall-y month of May.